Who else goes crazy for pumpkin season? It’s my favorite time of year from carving pumpkins for Halloween to the soft and fluffy muffins at coffee shops. The flavor, the smell and the feeling of the season brings a smile to my face regardless of my mood. With that said, I wanted to bring that joy to all of you reading as well. I racked my brain for a few ways to use pumpkin in your fall cooking and came up with three recipes that I’m still drooling over, especially today’s. Who doesn’t love pancakes? They’re a staple breakfast food and come in all shapes, sizes and flavors. From fresh blueberry to indulgent chocolate chip, pancakes are a canvas for flavor experimentation. 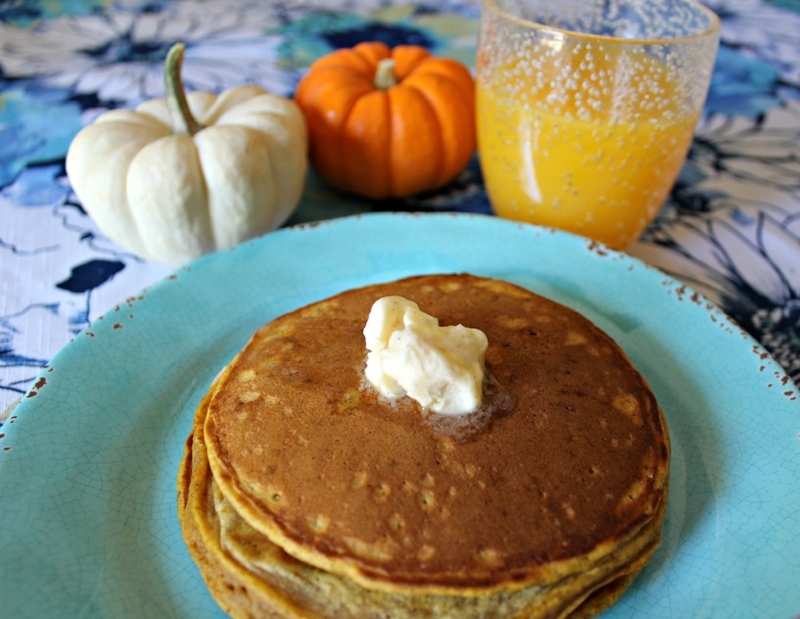 Pumpkin pancakes are not uncommon during the fall season. I wanted to spice them up a bit but felt that messing with the typical pumpkin pancake would be a mistake. Instead, I messed with the butter that goes on top. This Cinnamon-Maple Butter is the perfect complement to pumpkin pancakes. It would go with any of your favorite fall treats too. Spread it on toast, a pumpkin bagel, those cranberry bagels you start seeing closer to Thanksgiving or even consider mixing it with fresh popped popcorn. All of the ingredients are sustainable too so store it in the fridge for use all fall and winter long. Pancakes are easy to make. Remember the ratio of 1:1:1 and you will manage. One cup of flour to one cup of milk to one egg give you your basic pancake base. Add in the few extra ingredients plus lots of spices and you’ve got yourself bomb pumpkin pancakes. 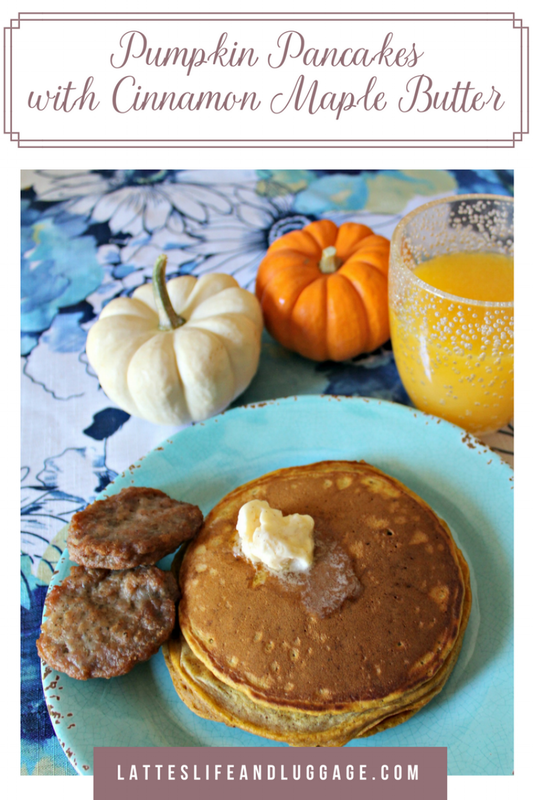 One thing to watch out for, the canned pumpkin will add extra moisture that you wouldn’t normally have in pancakes. With that in mind, go easy on the milk and add what you need a little at a time. You don’t want your batter to get too thin otherwise you’ll have rather flimsy pancakes and no one likes those. So while that ratio is foolproof for most pancakes, when you're adding extra wet ingredients, make sure to not add all your milk at once. Incorporate it slow instead. 1 - For the Butter: Using a rubber spatula, mix together the butter, maple syrup and cinnamon until well-incorporated. Wrap with plastic wrap or place in a glass container. Refrigerate until ready to go. 2 - For the Pancakes: In one bowl, mix together the flour, baking powder, baking soda, salt and spices. In another bowl, mix together sugar, egg, milk, butter and vanilla. Pour the wet ingredients into the dry ingredients. Mix until all the ingredients are well incorporated and then fold the pumpkin until just incorporated with the rest of the batter. 3 - Pour about ¼ cup of batter onto a griddle in a circle. When the batter gets bubbly, flip the pancake. Let it cook on the second side about 3-4 more minutes until the center is done. Repeat. Serve with the cinnamon maple butter.